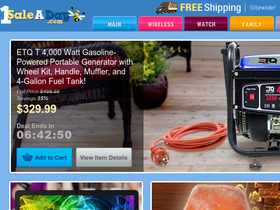 Go to 1 Sale A Day, online at 1saleaday.com, to find daily deals on a variety of top products. 1 Sale A Day offers huge discounts everyday on electronics, jewelry, watches, sunglasses, personal care products, family items, computers, wireless products, and more. 1 Sale A Day carries quality brands like Puma, Dr. Scholl's, Samsung, Shadora, Geneva, and more. 1 Sale A Day is the shop for finding great gifts and products for lots less. But before you shop, get all the best 1saleaday.com discounts, 1 Sale A Day promotions, and 1 Sale A Day coupon codes found here at RetailSteal.com. 1 Sale A Day ships to the United States, including APO/FPO addresses with some restrictions. See site for more information. Save up to 97% on name brand products from 1 Sale A Day. Click link to save on brands like Samsung, Puma, Dr. Scholl's, and others. Get free shipping on products in the Flash Sale at 1 Sale A Day. Click here to shop now and save. Save 97% on electronics from 1 Sale A Day. See today's deal to save on brands like Motorola, Olympus, Fuji, and more. Save up to 97% on the watch daily deal at 1saleaday.com. Click here to view today's discount and save on brands like Invicta, Geneva, Smith & Wesson, and more. Shop the jewelry daily deal at 1 Sale A Day and save up to 97% on great brands. Click here to view today's deal. Enjoy 5 huge deals everyday at 1saleaday.com. Click here now to save on electronics, watches, jewelry, and more. Visit Abe's of Maine online at AbesofMaine.com and save up to 40% on daily deals and deals of the week. Click link to peruse selection. Use this coupon code online at Hobbytron.com to save 5% on science kits and accessories. Click link to start shopping. Enjoy free FedEx ground shipping from 4AllMemory when you spend at least $400 online. Click link to shop. Enjoy free ground shipping on your BrickHouse Security order over $99. Shop and enter coupon code to save. Visit the Clearance section of BrickHouseSecurity.com to find deals of up to 60% off! Click link to get started.